As January 20 comes to a close, so does the 128th anniversary of the birth of that great song spinner Huddie Ledbetter, better known as Lead Belly. I know of no better way to celebrate the life of such an important hero of American music than with this type of musical extravaganza. I’ll admit that I did not realize the date until this very day, and this is a bit of a rush job, so as not to miss the occasion entirely. I was lucky enough to find this great album set from Capitol Records at the same time as that home recording, and, featuring not only Lead Belly, but a variety of other great artists, I believe it’s perfect for the occasion. 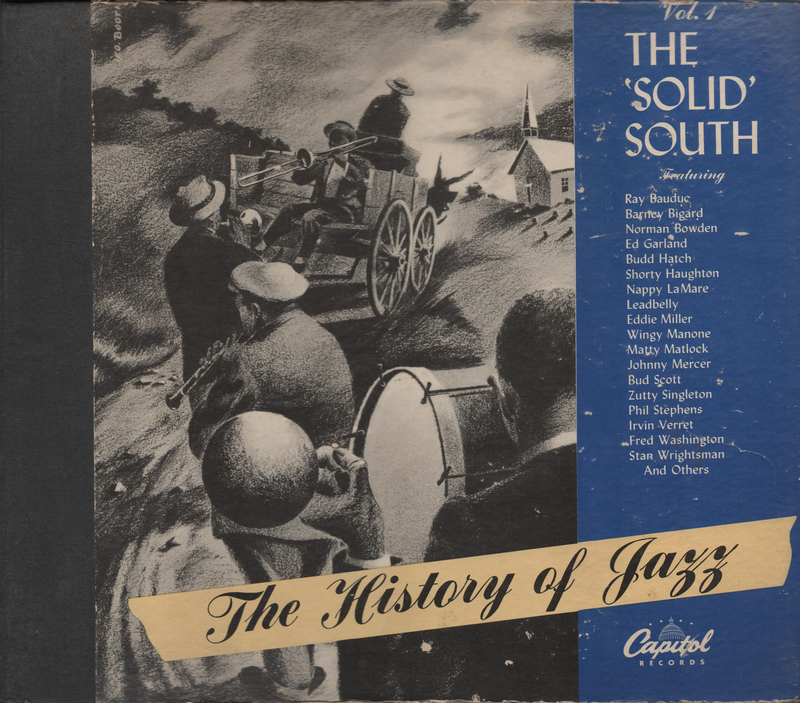 Now, I couldn’t tell you that this set is a historically accurate history of jazz music, but it does feature some fine tunes. The man of the hour, Lead Belly. From album’s inside cover. Capitol CE 16 was released in early 1945, and contains five discs, a step up from the typical four. The individual sides were recorded on the following dates: 10021 on October 4 and 27, 1944; 10022 on June 30, 1944; 10023 on June 30 and January 27, 1945; 10024 on March 7, 1944; and 10025 on January 27, 1945. These records feature a great number of fine artists, the highlights being Lead Belly, to whom this post is dedicated, Wingy Manone, Johnny Mercer (who founded Capitol), Zutty Singleton, and many others, whose names can be found listed on the album cover pictured above. 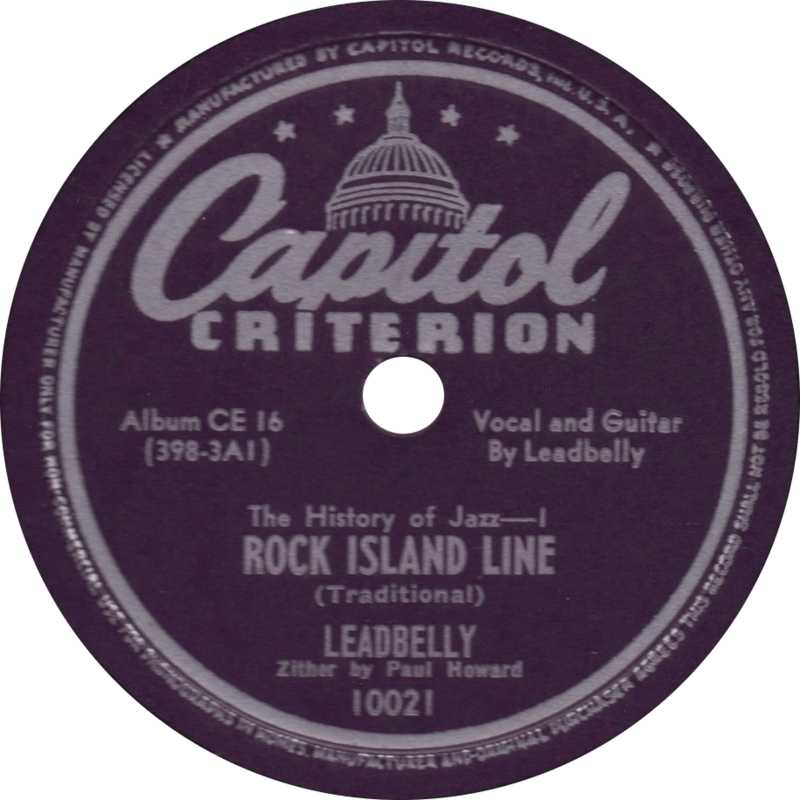 Capitol’s first volume of their “History of Jazz” series begins with a spoken introduction by Lead Belly, telling the story of the “Rock Island Line”, with zither backing by Paul Howard. 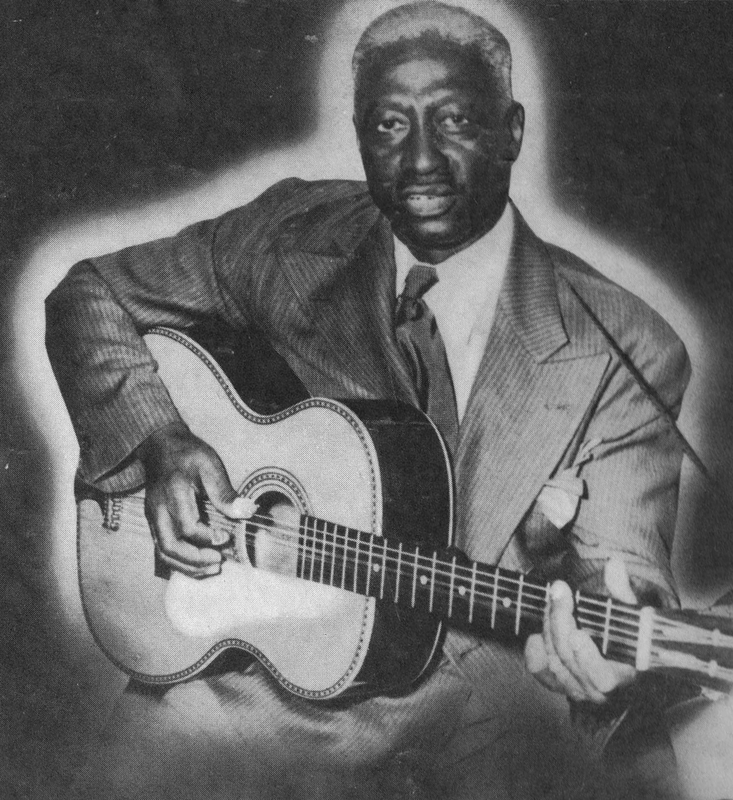 Rock Island Line, recorded October 4, 1944 by Leadbelly. On the reverse of the first disc, Lead Belly switches from his typical twelve string guitar to piano on “Eagle Rock Rag”. 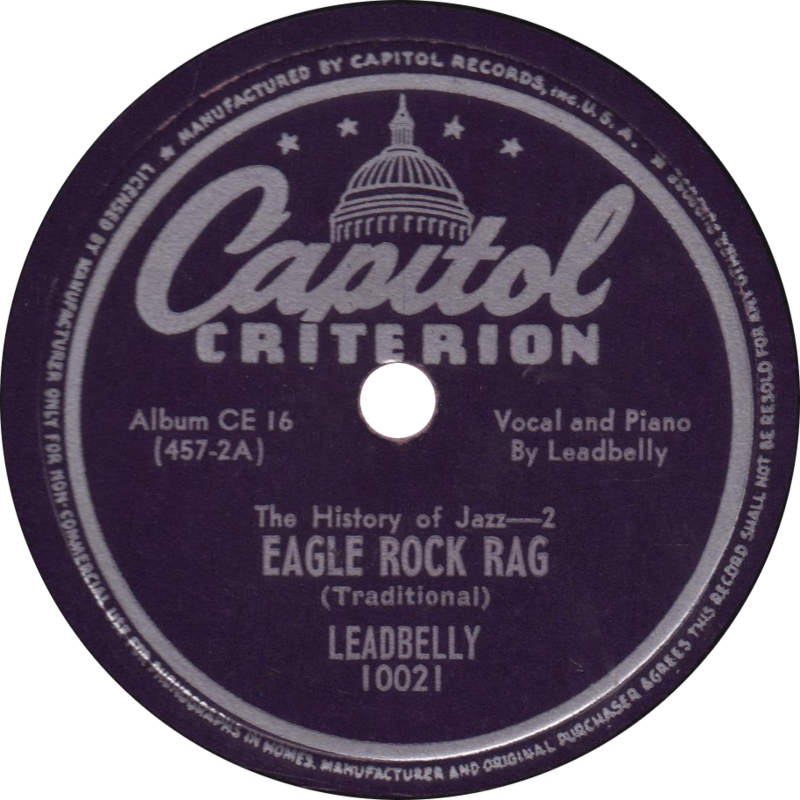 Eagle Rock Rag, recorded October 27, 1944 by Leadbelly. On the next disc, Zutty Singleton’s Trio first plays “Lulu’s Mood”. 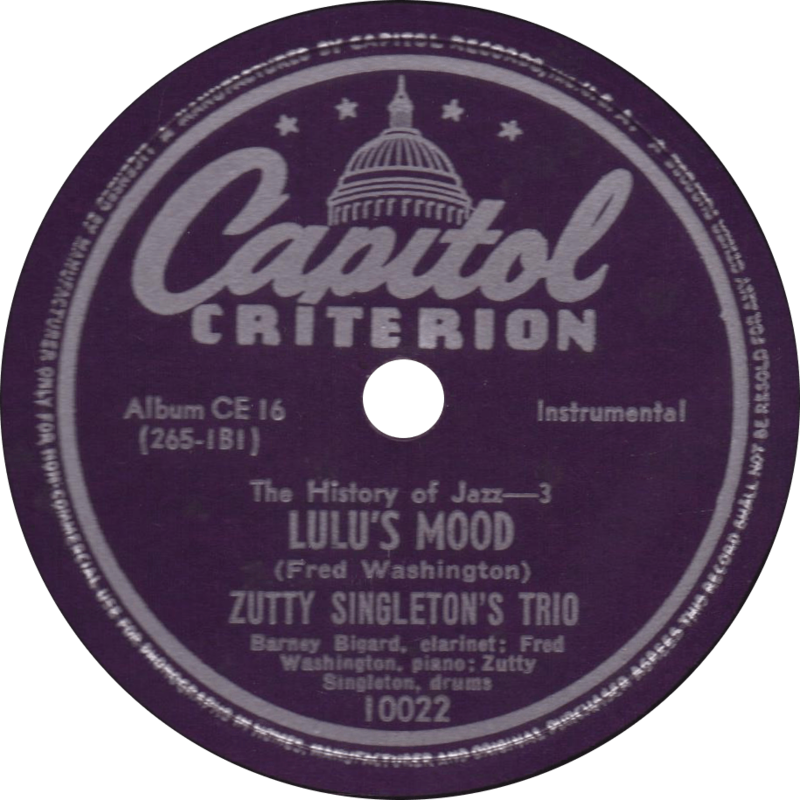 Lulu’s Mood, recorded June 30, 1944 by Zutty Singleton’s Trio. They follow with “Barney’s Bounce”, both sides featuring Barney Bigard on clarinet. Barney’s Bounce, recorded June 30, 1944 by Zutty Singleton’s Trio. Next up are two down home style tunes. First, Zutty Singleton’s Creole Band, expanded from the previous group, plays “Crawfish Blues”. 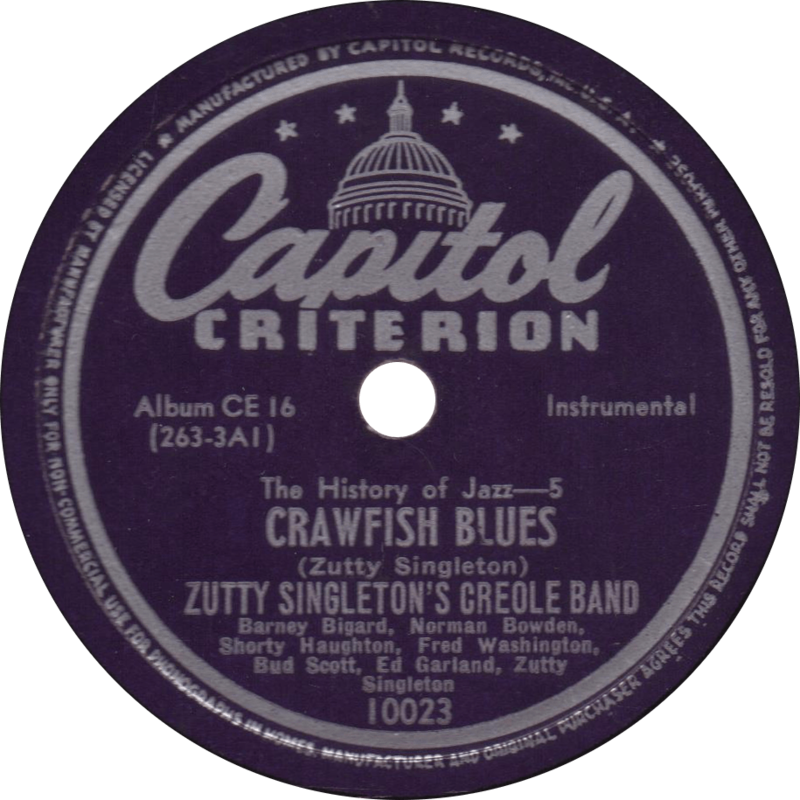 Crawfish Blues, recorded June 30, 1944 by Zutty Singleton’s Creole Band. On the flip, “Cajun Love Song” is a neat side with a Cajun vocal by Irvin Vennet, and some fine guitar playing from Nappy LaMare. 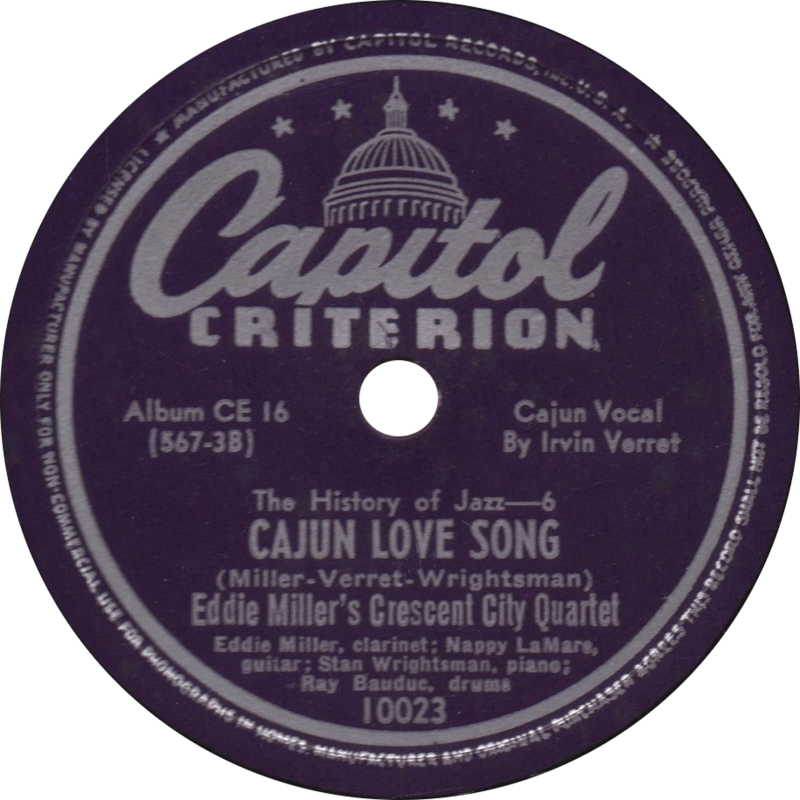 Cajun Love Song, recorded January 27, 1945 by Eddie Miller’s Crescent City Quartet. On the third disc, Wingy Manone and his Dixieland Band play two hot ones, first on “The Tailgate Ramble”. 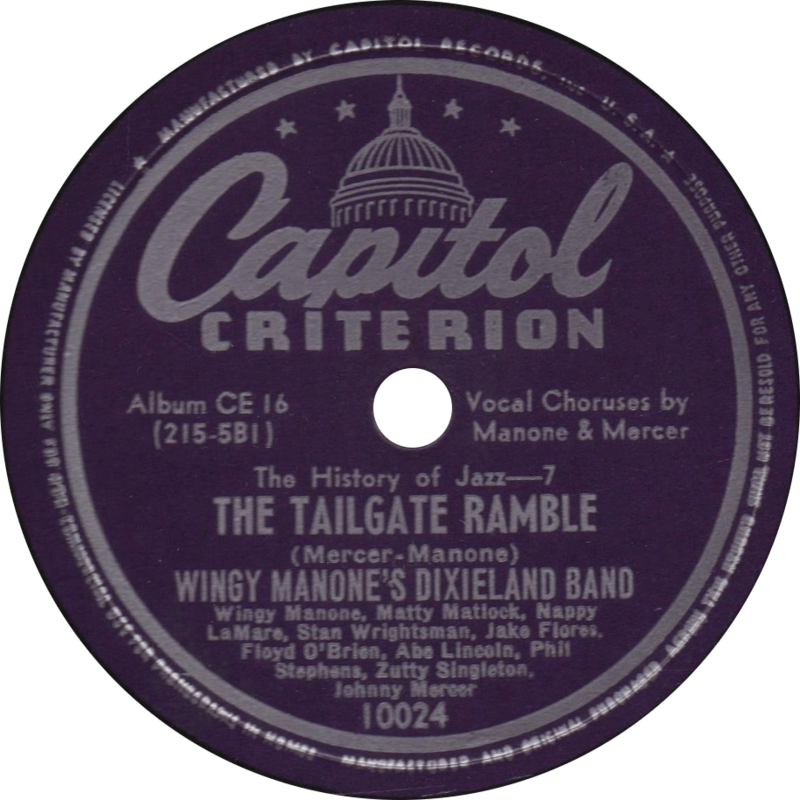 The Tailgate Ramble, recorded March 7, 1944 by Wingy Manone’s Dixieland Band. They back it up with “(I Wish I Could Shimmy Like My) Sister Kate”. 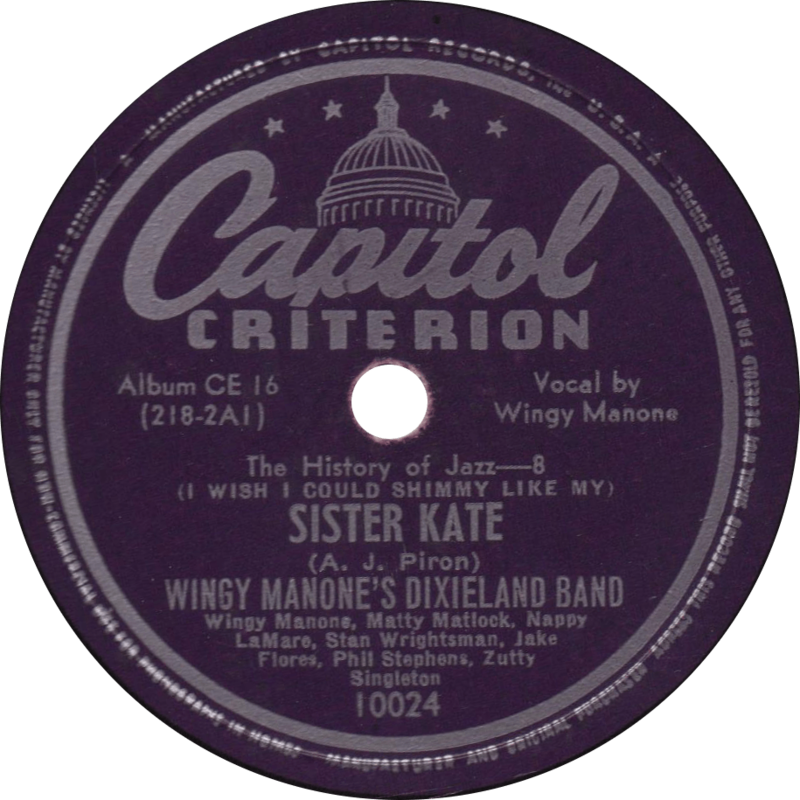 (I Wish I Could Shimmy Like My) Sister Kate, recorded March 7, 1944 by Wingy Manone’s Dixieland Band. The last time we heard “At the Jazz Band Ball” it was played by Bud Freeman’s Chicagoans on another album set, personally, I believe this one by Nappy LaMare’s Louisiana Levee Loungers is better. 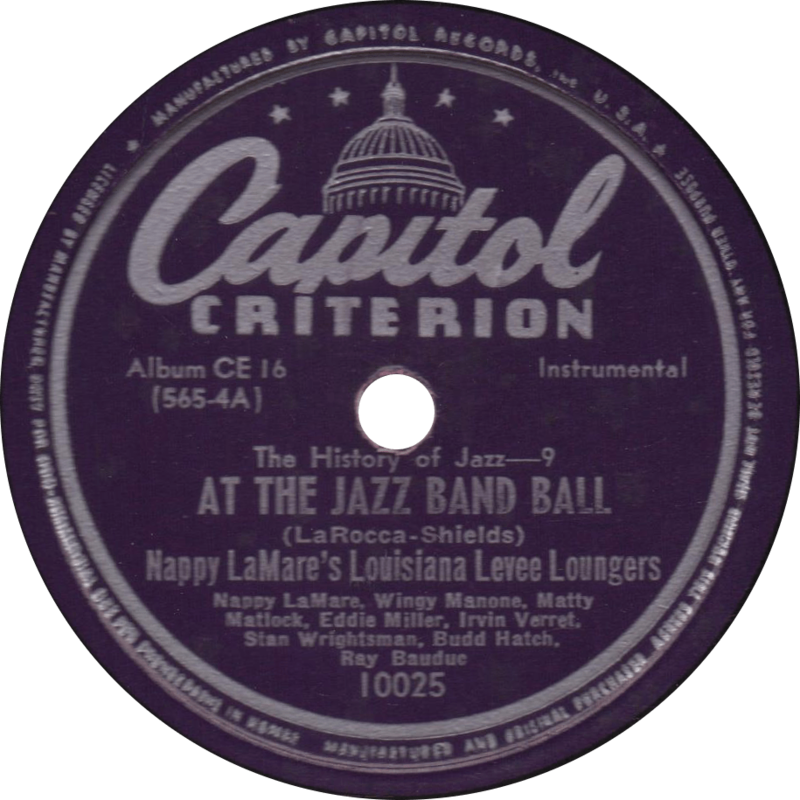 At the Jazz Band Ball, recorded January 27, 1945 by Nappy LaMare’s Louisiana Levee Loungers. On the grand finale of this set, LaMare’s band heats up on “High Society”. 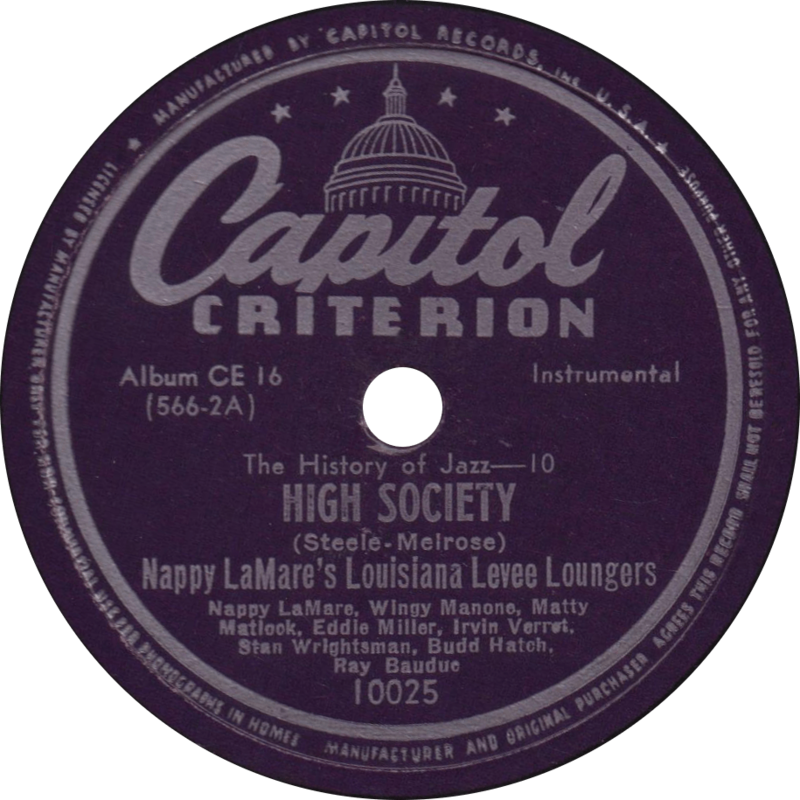 High Scoiety, recorded January 27, 1945 by Nappy LaMare’s Louisiana Levee Loungers. Updated on July 24, 2017 and April 28, 2018. This entry was posted in Records and tagged 1940s, 1945, Barney Bigard, Blues, Cajun, Capitol, Irvin Vennet, Jazz, Johnny Mercer, Lead Belly, Matty Matlock, Nappy LaMare, Ray Bauduc, Wingy Manone, Zutty Singleton by R. Connor Montgomery. Bookmark the permalink.